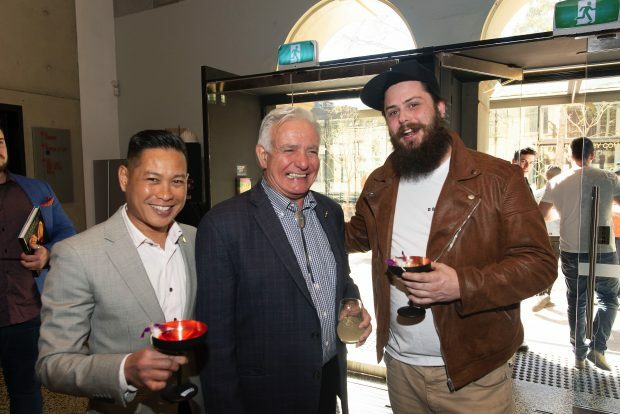 Global bartending legend Dale DeGroff kicked off his Australian tour over the weekend, entertaining both consumers and members of the trade at two separate events in Sydney. In a first for De Kuyper’s global ‘The Works’ program, more than 70 ticketed guests attended a consumer event at Kittyhawk in the Sydney CBD on Friday 3 August – a milestone for the formerly trade-only program. DeGroff entertained guests with tales of his time at the iconic Rainbow Room in the 1980s and his truly encyclopaedic knowledge of classic cocktails – all, of course, with a cocktail in hand. This was followed by a trade event on Sunday 5 August, attended by a number of Sydney’s top bartending talent. The fourth edition of De Kuyper The Works Australia – following appearances by Jeff ‘Beachbum’ Berry, Alex Kratena, and Nicolas St. Jean – was held at the Eternity Playhouse in Darlinghurst. Attendees had the opportunity to pick up new knowledge across the liqueurs category and inspirational creative mixology techniques, while learning about the craft history of cocktails, twists on classics recipes – for example the Yuzu Margarita or Blackberry Julep – and the history and modern-dary production of De Kuyper. “De Kuyper is determined to be the key ingredient partner of every great cocktail in bars and homes alike, so we partner with the best the world has to offer to develop that creativity and inspiration in cocktail makers,” says Pete Hollands, De Kuyper Brand Ambassador for Australia. Currently in Brisbane, DeGroff will continue his tour around Australia with dates in Perth (9 August) and Melbourne (12 August) on the near horizon.